Dipper Malkin are a captivating new duo, whose beginning was but a whisper. That whisper has steadily grown to become a clamour over the last year. Dipper Malkin are rapidly earning a reputation for elevating traditional music to new heights of sturdy beauty and sophistication. 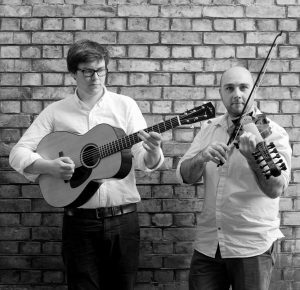 Dipper Malkin is the “potent combination” (Folk Radio UK) of two musicians that have spent their careers to date involved in groundbreaking projects. John Dipper (viola d’amore) was one third of The English Acoustic Collective alongside Chris Wood and Robert Harbron and currently works with string quartet Methera, while Dave Malkin (guitar, voice) was a founding member of trio Tandem, stylishly combining traditionally informed compositions with live electronics. With their highly-anticipated debut release, Tricks of the Trade, it is clear that Dipper Malkin realise that they are the lucky benefactors of previous generations’ invention, celebrating their inheritance through every note, whilst avoiding the trap of complacency by offering their own inventions. In just 18 months, John Dipper (English Acoustic Collective, Methera) and Dave Malkin (Tandem) have managed to earn a reputation for themselves as thrilling performers, and inventive and skilful composers. They celebrate previous generations’ invention, whist avoiding the trap of complacency by offering their own inventions; their carefully honed instrumentals and songs breaking new ground yet routed in the tradition.